The North America electrical fuses market is likely to witness the advent of more compact and slimmer electronics with leading players vying to cater to ever-changing consumer preferences. The development of the latest technologies and innovation have thus emerged as the most defining trends in the market. The electrical fuses market in North America is primarily driven by the rising demand for electricity and efficient power delivery systems. Besides this, diverse applications of electrical fuses across various industries will also fuel demand from the market. Bolsted by these factors, the market for electrical fuses in North America is expected to have a CAGR of 6.0% between 2016 and 2024, forecasts Transparency Market Research (TMR). As per TMR, the North America electrical fuses market stood at US$1.84 bn in 2015 and is expected to reach US$3.09 bn by the end of 2024. 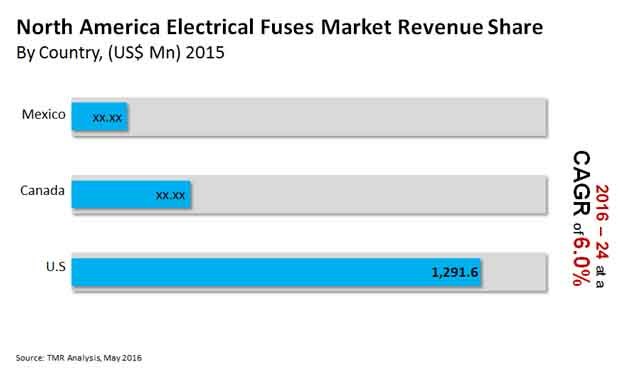 The U.S., Canada, and Mexico make the most lucrative markets for electrical fuses in North America. Among these nations, the U.S. held the largest share in the market in 2015. The rising demand for electrical fuses from the automotive and construction sectors of the country has catapulted it to the forefront of the North America electrical fuses market. In the same year, Canada emerged as the second-largest market for electrical fuses in North America, trailed by Mexico. The electrical fuses market in the U.S. is poised to reach US$2,152.0 mn by 2024 from a valuation of US$1,291.6 mn in 2015. The market is therefore poised to exhibit a CAGR of 5.9% from 2016 to 2024. Additionally, in countries such as Mexico and the U.S., the production of vehicles has substantially increased, which has positively influenced the application of electrical fuses in the automotive sector. As a result of urbanization and industrial development, demand for electricity and reliable power delivery systems has been persistently increasing in North America. This has in turn given the sales of electrical fuses across the automotive and construction sectors a fillip. Electrical fuses are used across these industries to ensure safety during electricity transmission and distribution across these segments. The construction segment led the North America electrical fuses market in 2015 in terms of revenue. In that year, the segment accounted for a dominant share of 40.3% in the market. By volume as well, the segment led the North America electrical fuses market in 2015, with a share of 45.4%. Furthermore, the advent of electrical vehicles also provides considerable opportunities for the market’s growth in North America. The increasing willingness among consumers to spend on hybrid and electrical vehicles is likely to bolster the applications of electrical fuses in EVs and hybrid vehicles. Some of the leading companies in North America electrical fuses market include General Electric,ABB Ltd, Eaton Corporation, S&C Electric Company, Schneider Electric SA, G&W Electric Company, Mitsubishi Electric, Siemens AG, Bel Fuse Inc., Mersen S.A and Littelfuse, Inc., among others. An electrical fuse can be defined as a device which is used to interrupt the flow of current by interrupting the electrical circuit during the condition of over current caused by short circuit and/or overload. During over current, the fuse element melts and saves the circuit as it disconnects the supply from the load. Electrical fuses are classified under different voltage segments such as low voltage fuses and high voltage fuses. On the basis of voltage level of installations, the electrical fuses market in North America has been segmented into two categories; low voltage fuses and high voltage fuses wherein plug-in fuses and cartridge fuses are the segments the low voltage fuses has been further categorized into. The electrical fuses market on the basis of application has been segmented into automotive, construction, consumer electronics, industrial, power generation and others. By country, the market has been segmented into the U.S., Canada and Mexico. The above segments have been covered in terms of both revenue (USD million) and volume (units million). The need for reliable power delivery in North America is one of the primary factors responsible for the growth of the electrical fuses market in the region. The demand for electricity has been significantly high as a result of various factors such as economic growth, technological advancements and increase in population in the past few decades. The construction and automotive sectors across North America are witnessing significant growth since the last few years which in turn has resulted in an increased demand for electrical fuses. Large spending on housing and automobiles is driving demand for electrical fuses in the region. The construction sector is also experiencing a boom which in turn has triggered demand for electrical fuses in North America. These factors in combination are expected to drive the demand for electrical fuses in North America during the forecast period. However, the advent of counterfeit switchgear and its components has adversely impacted the growth opportunities for the electrical fuses market. These products often copy the external look and design of leading companies’ products and are of poor quality and less reliable. Profitability of original switchgear manufacturers has decreased due to the presence of counterfeit switchgears in the market. North America possesses significant opportunities for the growth of the electrical fuses market. Electric vehicles and solar energy are expected to witness a boom in the near future and are projected to be emerging markets for electrical fuses. There is greater diversity of fuses in vehicles as vehicles consume more power than before. Hence, the count of electric fuses in vehicles is projected to increase. The company profiles of the major players in the electrical fuses market in North America has been extensively covered under the purview of the study. Moreover, the business strategies being adopted by the major players in the market have also been included in the report. The market attractive analysis and value chain analysis have also been provided in the report for providing a detailed insight into the North America electrical fuses market. The market dynamics, which includes the market drivers, restraints and opportunities, has also been included under the scope of the report. Market dynamics help to understand the current trends in the global market by providing insights of the distinctive factors that influence the growth of the specific market. Thus, this report provides an inclusive study of the North America electrical fuses market. Some of the major players operating in North America electrical fuses market are: ABB Ltd, S&C Electric Company, Eaton Corporation, G&W Electric Company, General Electric, Mitsubishi Electric, Bel Fuse Inc., Schneider Electric SA, Siemens AG, Mersen S.A and Littelfuse, Inc among others.